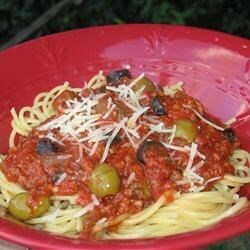 "This tomato sauce combines the flavors of garlic, onion, kalamata olives & capers. It is wonderful over any pasta or as a sauce for white fish or chicken." In a skillet, cook onion in olive oil over medium high heat until tender and translucent. Stir in garlic, and cook for 1 minute. Add tomatoes, tomato sauce, capers, olives, vinegar, salt, pepper, and crushed red pepper (if using). Reduce heat, cover, and simmer for a minimum of 30 minutes, or up to 2 hours, time permitting. Serve over pasta, fish, or chicken, and top with crumbled feta or grated Parmesan cheese. Enjoy! Nothing special, not bad though. This was delish! I will definately be making this again! this is going to be used a lot more in my house!! This was good. I forgot to cover mine while it was simmering and it was too chunky. If it were thinner it would have been better, but that was my fault. I used feta and served it over pasta.